This is an Irish [ Rebel ] song associated with the most recent conflict in Ireland. Words and music by Tommy Skelly. This is a hard hitting rebel song that very few ballad groups include at their gigs. It's being covered by The Wolfe Tones and a few others. The banjo tab is in G Major. Included are the letter notes. The verses and chorus basically use the same notes, but there's a couple of Added Notes''. Any problems playing it, just give me a shout. Some people come here to learn the piano keyboard / accordion notes for songs. 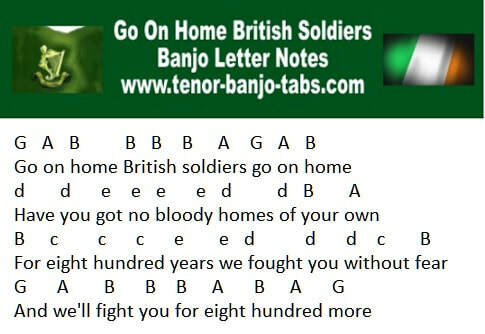 ​Below is an image of what notes to play for my version.